No coupon code is required, just look for and select the Musson Super Saver Shipping option when completing your purchase or quote. As a bonus, we'll extend free ground shipping to most accessories for eligible products. Eligible products will display a special note, and can usually be upgraded (paid) to a faster shipping method if desired. 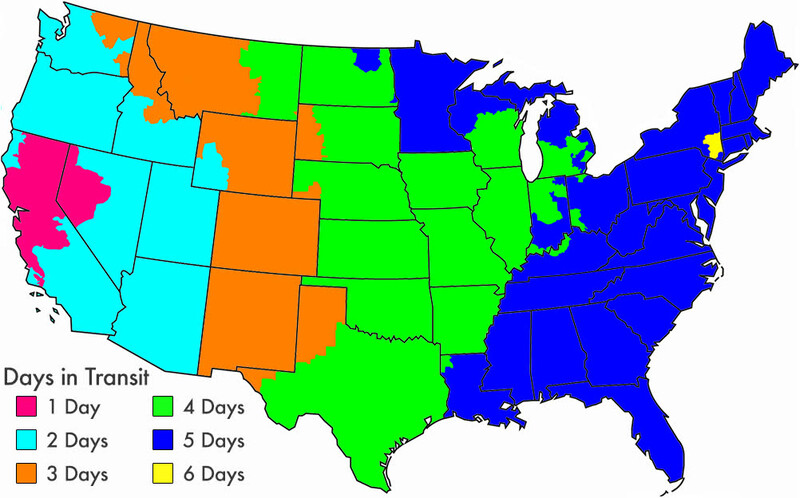 The map below shows average time in transit once an item ships from our Santa Clara, California location. For back-ordered items an additional lead time may apply. When possible, we'll drop-ship backorders directly to you, however due to tax penalties in some states, this regrettably isn't always possible. For 48 contiguous states only. In Alaska, Hawaii, or a US Territory? Email us for a shipping quote!